As we approach another of the wildly popular bobblehead nights (ahem, told you Sean), the Predators decided to have a little fun with this one. 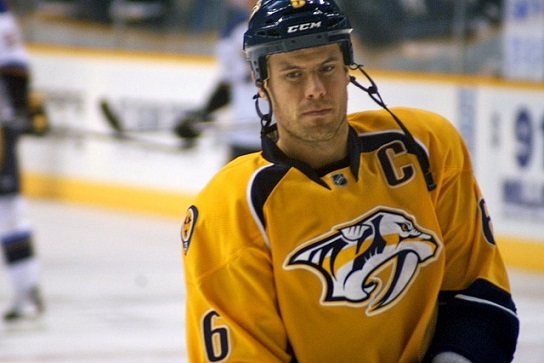 Perhaps taking a dig at the #Flyers' unsuccessful bid to sign a certain D-man in 2012, the #Preds will give away Shea Weber bobbleheads Sat. Do we really need to take a look back at what has spurned the love-hate that exists between Nashville and Philadelphia? The “stunning coup” as Paul Holmgren swooped in like a vulture, taking Timonen and Hartnell, and leaving Nashville with a pick that was used on Jonathon Blum, or maybe throwing Ryan Parent back at us when trying to sign Dan Hamhuis (say it with me, Ham-hoose). Maybe the Flyers owners considered the future consideration involved with the Sergei Klimentiev trade as worthy of their offer sheet of Shea Weber? Regardless, it’s obvious that Philadelphia has viewed Nashville as another minor-league affiliate that they can pick and choose who to add to their own coffers. Is tonight about more than a bobblehead.. of course it is! Shall we recap? Philadelphia picked Nashville’s bones clean during the Leipold fire sale. Philadelphia fired Peter Laviolette after three games last season. Philadelphia, born and raised, on the playground was where I spent… wait, no..
Philadelphia, worst of all, attempted to sign away one chamber of the heart and soul of the Nashville Predators (Shea Weber, if you’re still humming Fresh Prince) for a contract the usually cash-strapped Nashville Predators weren’t supposed to be able to match. Guess what Comcast Flyers, they matched, and Shea is still Our Captain. So, is tonight about a little more than a bobblehead? Yeah, you could say that.